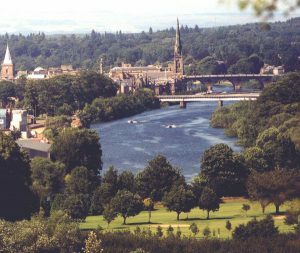 Known as the Fair City, Perth is one of Scotland’s most historically important towns. Once the nation’s capital and home to the legendary Black Watch, Perth is ready to welcome visitors with a stunning array of architectural heritage, enthralling museums and great entertainment venues. Perched above the town on the opposite bank of the River Tay, Scone Palace stands sentinel over Perth. Home to the Earls of Mansfield, the Palace sits at the gateway to the Highlands and the east coast, underlying its prominent political and defensive role in Scotland’s history. Today, the Palace is a magnificent building worth a visit, and it has one of the finest private museum collections in Europe with everything from porcelain to clocks. The grounds are also well worth exploring with Moot Hill, the crowning place of Scottish kings, Formal Gardens and Wild Garden offering pleasant walkways and interesting structures. Around Perth, you’ll find plenty of sites to keep your interest. Perth Museum and Art Gallery documents the amazing history of the town and exhibits works by some of Scotland’s most famous artists. Balhousie Castle is home to the Black Watch regiment and has its own fascinating museum, while St John’s Kirk had an important role in the Reformation. Castles abound in the countryside around Perth with highlights being the haunted Glamis Castle and Loch Laven’s island fortress. One of the most stunning views in all of Scotland can be witnessed at Queen’s View. Perth’s pedestrianized High street is a focal point of the town with lively markets, a wide range of specialty stores and some of the best restaurants, cafes and pubs. Equally popular are the streets around St. John’s, which have their own unique ambience. The whole family can have a good time at the nearby Loudoun Castle, an exciting theme park set on the grounds of a ruined fortress. Pirates seem all the rage here, with a number of thrilling rides such as the ‘Black Pearl’ and ‘Skelter’ based on the theme.